Christmas traditions in Peru are believed to have been established sometime around 1535. This was the year Francisco Pizarro took control of Lima two years after defeating the Inca emperor Atahuallpa. Christmas celebrations have traditionally been religiously based. Given that the majority of the Peruvian population practices Catholicism, it comes as no surprise there is a long and celebrated history of Christmas traditions. Some of these traditions are similar to those practiced in the United States and Europe since they revolve around the Church. There are also a few traditions that are very different. Though traditions may vary by region, there are some that are common. December is the first month of summer in Peru, with the first day of summer falling just before Christmas, on December 21 (the winter solstice in the Northern Hemisphere). While students in the US, Canada, Europe and other countries in the Northern Hemisphere are on winter break, in Peru the students are enjoying a summer break. Santa Claus became part of the Peruvian celebrations sometime in the late 1800s. While St. Nick has a commercial foothold in the culture and is a fun element of the celebration, the prominent focus is still the religious celebration of the birth of the Christ child. Chocolatadas is an event that takes place throughout Peru during the weeks before Christmas. The tradition began as a way to share with those less fortunate during a blessed time of the year. According to the Dos Manos Peru Blog, children and others are gifted with cups filled with hot chocolate, white cake (Panetón) filled with dried fruit and various small gifts. Practicing Catholics attend a special mass known as Misa de Gallo that usually takes place at 10pm. Afterwards, everybody goes home to open gifts and feast on an elaborately prepared Christmas dinner of traditional roasted turkey. According to the Dos Manos Peru Blog, those who can't afford turkey prepare chicken (Pollo a la Brasa). At midnight, the adults toast with champagne and children raise their glasses of hot chocolate as fireworks explode in the night sky and continue throughout the night. Presents are usually exchanged and opened either before the family meal or afterwards. However, this can vary by region. In Andean regions of Peru, for example, gifts are typically exchanged on January 6 (Epiphany) after the celebration of the arrival of the Three Wise Men. After the smaller children are put to bed, the adults may continue the Noche Buena celebration until the wee hours of the morning. Many families have big house parties that include music and dancing. In order to prepare their homes for the festivities, many families will clear their living room and dining rooms of furniture in order to transform them into dance floors. Of course, after celebrating all night long, most sleep in on the morning of December 25. Most Christmas meals served in Peru include the traditional turkey as well as tamales, salads, applesauce and a sweet bread called Panetón or Panettone (taken from Italian tradition). The hot chocolate is usually made from scratch using melted rich dark chocolate, cinnamon and cloves. 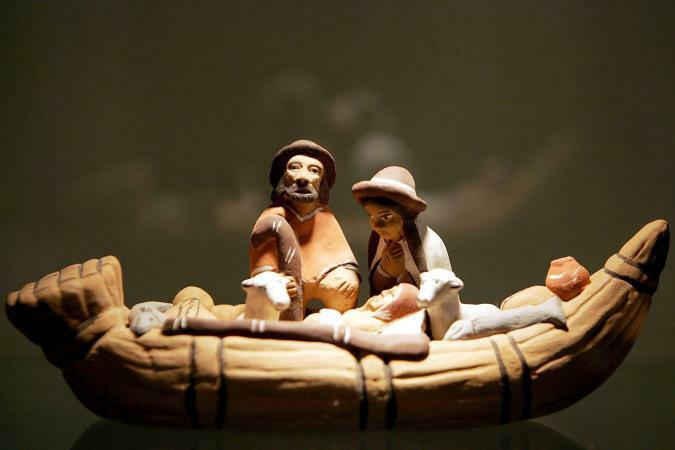 The Nativity manger is a focal point of Christmas decorations in a typical Peruvian household. Most mangers feature intricate detailing and are carved out of pottery, wood or huamanga stone. The manger is what the gifts are spread around on Christmas Eve. Another tradition is for the Nativity manger to feature native animals such as llamas and alpacas instead of sheep and goats. Some areas have live nativity scenes. The baby Jesus figurine isn't placed in the manger until the stroke of midnight, signifying his birth on Christmas day. A child is often chosen to place the figurine in the manger. 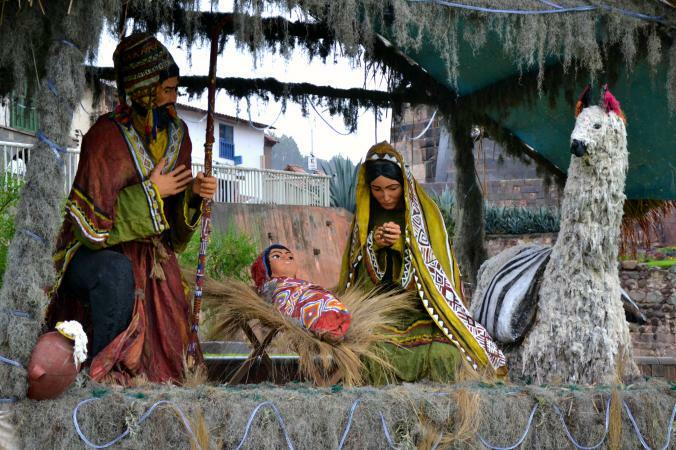 In modern Peru, the traditional Christmas celebration centering centers on the birth of Jesus the Christ and follows the Church calendar dates of festivities. Many of these traditions are shared around the world, while some are specific to Peru.